I have a really, really good chocolate buttercream recipe in my book The Allergy-Free Cook Bakes Cakes and Cookies. 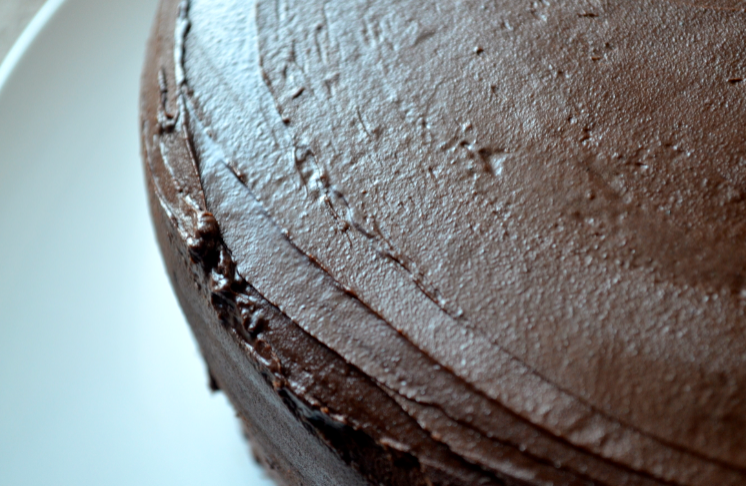 For a long time, it held the position of my favourite chocolate buttercream. Not necessarily my favourite chocolate frosting (hello? Have you tried the Chocolate Macadamia Frosting in the book? That’s my favourite…), but definitely the best chocolate buttercream. I mean, that’s why it is in the book after all. The Best Chocolate Butter Cream. Ever. Melt the chocolate over a double boiler. Let cool to room temperature (or, if you’re like me, be impatient and put the bowl in front of the fan in your makeshift Cooling Station). Put the icing sugar, vegan buttery spread, 3 tablespoons of the nondairy beverage, vanilla extract, and salt in the bowl of a stand mixer or a large bowl. Using a hand mixer or a stand mixer, beat until fluffy and well-combined, scraping down the sides as needed, for about 3 minutes. Turn the mixer to low speed and stream in the chocolate. Scrape down the sides again, then beat for two minutes. Add the cocoa powder and a few splashes of nondairy beverage. Beat again, adding more nondairy beverage as needed, until light, fluffy, and luscious. Sample it a few times, then spread it on the cooled cake, licking the utensils, bowl, mixer (unplugged), as needed.